Summer is almost done and even though you don’t want to see summer go, at least you can console yourself by decorating your school supplies. Maybe it’s not the best consolation for the end of summer, but personalizing your school supplies a fun activity to gear up for your first day of classes. If you have some your old textbooks around you have living proof of how beat up your books can get by the end of the year. With spilled drinks, or gum between the pages, all are part of what the books end up looking like. Book covers are a great way to keep your books tidy. And Apple stamping the construction paper you wrap them in guarantees you’re ready for the school year with very cool looking book covers. First you need to stamp the paper. Cut your apple in half and dip it in a tray of paint, the color is up to you. Stamp your paper however you like and use any other decorations you might want to add. Painting the stem of the Apple, a study warm, a dinosaur or whatever you like and let it dry completely. When the papers dry, open your book on the underside of the paper meeting the non-painted side. Cut the paper so there’s about a 5-inch border around the book. Fold the paper on the covers corners and tape them down to the inside of the book. Cut the paper so it lays flush against the spine of the book. You cannot fold the paper to the cover here because of the pages. Tape any loose pieces of paper to the cover just to secure the entire thing. Feel free to put your book through whatever comes your way. It’s also a good idea to mark where you left off in your book and bookmarks are simple and wonderful ways to do that. These bookmarks are perfect for your new school year. Cut the corner of the envelope at a diagonal. You should have a diamond shape that will fit the corner of the page. Cut two triangles of your decorative paper to put on the diamond triangle shape. This will make the face and when you glue it, it should have a gap along the center of the diamond. You can also draw on the envelope diamond to make the face. Using the white paper, cut out eyes and jagged teeth. The eyes and the top triangle of the diamond and glue the teeth so they stick out from under the pocket of the envelope. Cut out black circles for the pupils of the eyes include those on. You can add any other decorations such as glitter or sequence. You have now made a book monster bookmark so you can mark your pages with it. Has your jewelry ever been in such a tangle that you gave up trying to untie all the knots and just leave the mess for another time? 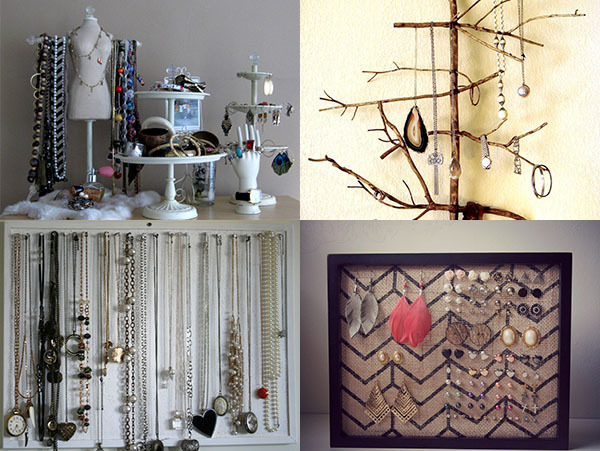 Here are some jewelry holder designs for you to try. 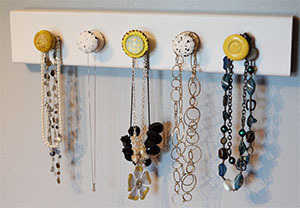 These are two simple projects for a necklace holder and an earring holder to help you untangle the mess, plus it adds a homemade and artsy touch to your bedroom or bathroom. What’s even more as you get to display your jewelry even when you’re not wearing it. You can use salvage doorknobs to easily organize your necklaces. You can find glass or metal doorknobs of all shapes and sizes at any thrift store or hardware stores. -A flat piece of wood or something painted or driftwood from the beach. -Doorknobs, as many as you need or will fit the piece of wood you want to use. -Nails to attach the board to the wall. Measure the size of the doorknob screws and drill the appropriate size hole for each knob and the piece of wood. If you are not used to using a drill this is the best time to learn or get an expert to help and supervise. Attach the piece of wood to the wall where you wanted to hang and you can hang it with nails or another type of wall hanger. Get ready to untangle your massive necklaces and hang them up. Trying to keep earrings and their backs all-straight is even a bigger task than keeping necklaces untangled because they are so small. 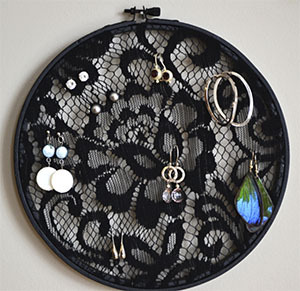 This is a lace earring holder and it’s perfect for organizing, displaying and maintaining your earrings, both studs and drops. When the lace is taut you can see the beautiful pattern and the soft fabric is gentle on the metal of your earrings. -Flat thumbtacks that are only used for the frame project. If you want to paint or decorate your frame or embroidery hoop do it first and let it dry completely. Measure cut lace to fit the size and shape of your frame or embroidery hoop. If you using a frame: stretch the lace across the back of the frame and with the flat thumbtacks secure it to the frame. If you use an embroidery hoop, stretch the lace between the two hoops and clamp the hoops together. Arrange your airings in the lace and hang on the wall and enjoy. If you keep seeing nightmares or dreams where you arrive to school naked and fail to run away because everything becomes slow-motion a dreamcatcher is what you need. The dreamcatcher is a craft that was popular among the First Nations people of Canada. The tradition of making dreamcatchers is believed to be started by the Ojibway people who lived in the Lake Huron area. According to the legend good dreams enter a person’s mind through the center of the web while bad dreams get caught in the web and vanish at the sunrise. Strong thread (traditionally sinew was used). Metal ring of any size. Make a knot to secure one end of the suede lacing on the metal ring. It is important that you leave about five inches of lacing to hang the dreamcatcher, then wind the suede tightly around the ring until it is covered in suede completely. Tie off the suede and make a loop by knotting the two remaining ends together. The loop is needed to hang the dreamcatcher on. Get several feet of thread or sinew. Tie one end of it to the top of the ring. Now the webbing represents a net of “half-hitch” knots. Then you need to make knots. At first loop the thread over the hoop towards the back, after that bring sinew to the front again. Just pull it up through the hole formed and make sure the thread pulled stays taut. Goon making such knots around the hoop, with the interval of seven or eight evenly spaced points. On returning to the top of the hoop, begin the next round of webbing. This time you should make knots on the loops of thread from the first round. Thread a bead into the webbing where you want. Make sure there is a small hole left when you finish making the web. Then tie a double knot and cut the rest of the thread off. Finally you need to make the feather tassels hanging off the dreamcatcher. 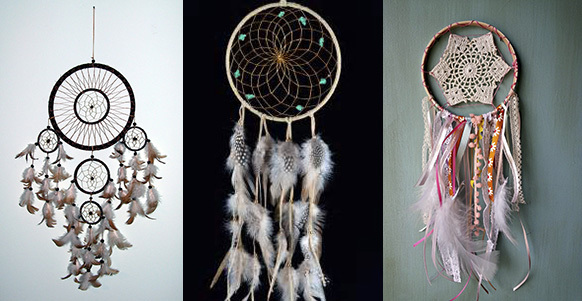 Cut several lengths of suede and tie them to the bottom of the dreamcatcher. Tuck a few beads onto each piece of suede and tie knots in the suede so they don’t move. Push the ends of the feathers through the beads and your dreamcatcher is ready!